Enjoy water views in three directions from Spinnaker’s unique location in the secluded Oyster Bay Community. 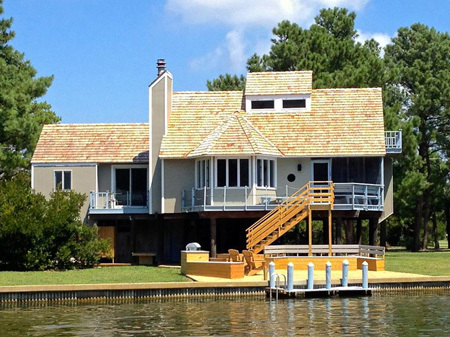 Tie up your boat, swim, or crab off Spinnaker’s private dock and 125 foot water frontage. Spinnaker has three decks; one is even great for sunbathing in winter. Enjoy the two story fireplace; bedrooms on three different levels (including a sleeping loft) for privacy; and the galley kitchen which has a pass through to the diningroom on one side and the screened in porch on the other. Open the french doors in the living room and the screened in porch becomes part of the room, along with incredible views. We supply everything we think you’ll need except sheets and towels which can be rented when you check in. Local merchants will rent you bikes or a boat and take care of any needs you have.